BROADVIEW, IL. July 27, 2015 – After winning multiple late race restarts to hold off Kevin Harvick and Joey Logano, Kyle Busch took his Bosch-equipped No. 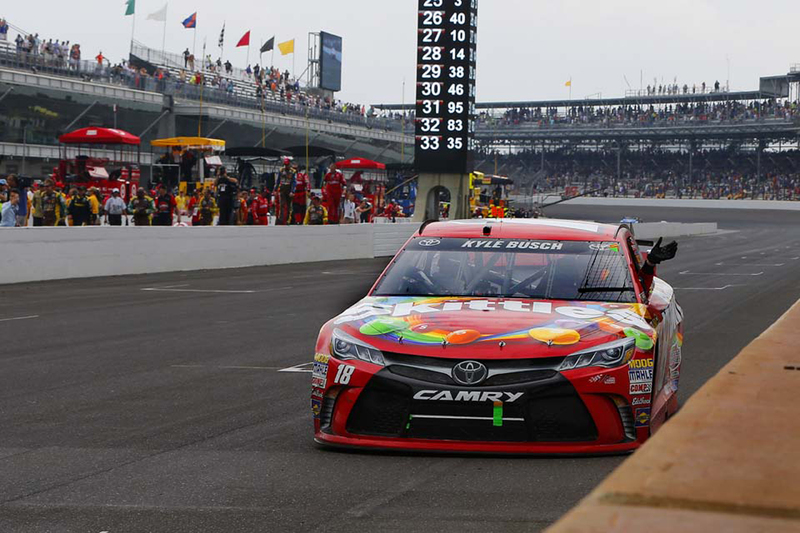 18 Skittles Toyota to Victory Lane at Sunday’s NASCAR® Sprint Cup SeriesTM Race in Indianapolis – his third win in as many weeks. In recognition of the victory, Bosch Aftermarket NA is once again making a $1,000 contribution to the Kyle Busch Foundation; his fourth of the year. Thus far in the 2015 NASCAR Sprint Cup Series season, Bosch-supported teams have won sixteen out of twenty races, for a total of $16,000 contributed to help carry out the missions of respective team charities.